NOW UP TO 200A FOR 50KW GENERATORS! If you prefer analog to digital displays this panel can show it all! Don't operate your backup or alternative power electrical system blind! 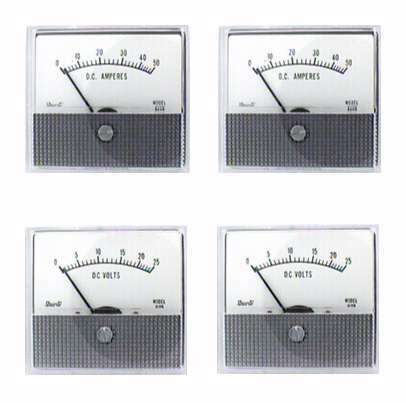 Install and connect these economical panel meters so you can see what is happening. Perfect for monitoring ac or dc system voltages, currents or frequency. If you have electronic loads that are sensitive to voltage or frequency variations that occur with small portable generators this is the solution. 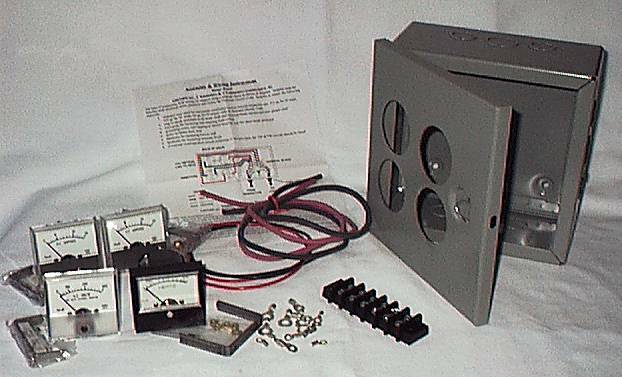 These meters are full rated devices so no shunts or current transformers are required. 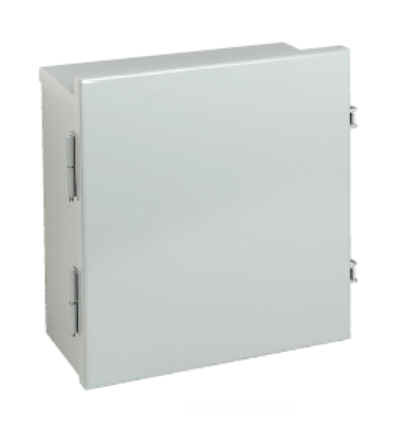 NEMA 1 enclosure is 8" x 8" x 4" deep, made of #16 gauge steel and comes with 1/2", 3/4" and 1" knockouts. Hinged front cover is supplied pre-punched for the number of meters you order. Enclosure is UL Listed and CSA certified. For maximum meter life we do not recommend direct mounting of enclosure on engine driven generators due to vibration. Mount separately on an indoor wall. 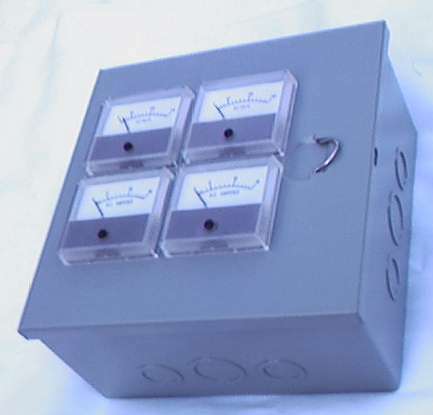 Ammeters, voltmeters and/or frequency meter are available. 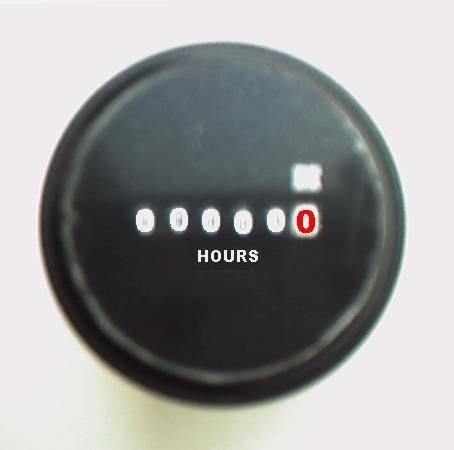 Meters are 2-1/2" rectangular, 5% accuracy and fit into 2-1/16" diameter holes in front cover. 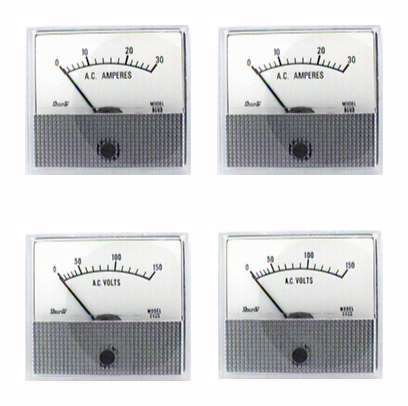 Note that frequency meters and two ranges of ac voltmeters come standard with expanded scales for high resolution reading. Barrier type terminal block included for easier wiring. You must mount and wire components. Depending on the type of wire, you must supply properly sized cord grips or strain relief connectors. Following meters are available and can be ordered using drop-down menus below. Some other ranges are available as special order at added cost. 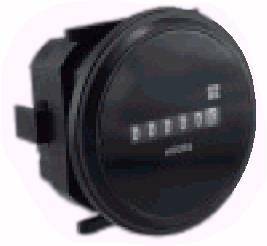 Hour Meters are quartz controlled for accurate time measurement on both 50Hz and 60Hz and even on dc. Mount in same size cutout as other meters and include hold-in collar. Connections are made with slip-on terminals. 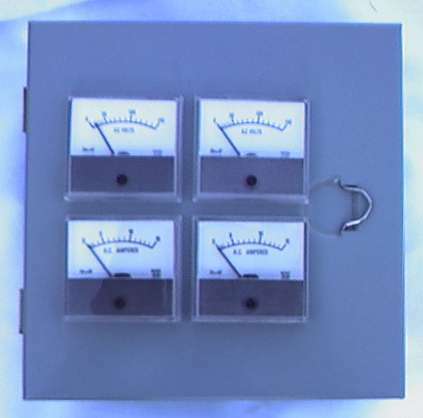 AC ammeters for high current applications come with donut current transformer for slipping over heavy power conductors. Shopping cart will apply price adder (listed in drop-down menu below) for frequency meters, ac current transformers and hour meters which cost more than other meters. Direct connected meters for 50 amps require a high capacity terminal block at slightly higher cost. If you order less than 4 meters price will automatically be reduced. 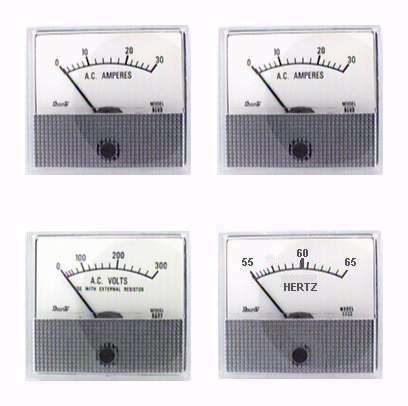 NOTE that use of ammeters for reading values less than 25% of full scale not recommended. That means we DO NOT recommend using 0-200A meters for measuring the load on your 200A utility service. Typical loads on a 200A service are less than 50A and you will not be able to read those values accurately.